Idli or Idly is a popular South Indian savory steamed cake which is usually made from rice and black lentils(urad dal). The batter is allowed to ferment overnight without yeast or other raising agents. Next day its steamed in a idli stand or in small bowls. Its a popular breakfast dish and is served with usually with a coconut chutney and sambhar. Sambhar is a lentil stew or dal, with some vegetables and spices added to it. The idli is soaked in the sambhar, topped with chutney and enjoyed. There are a variety of instant Idlis which requires no fermenting and can be made within 30-40 minutes. The most common one is made using semolina but these days other grains are also used. Its a low calorie, filling and healthy breakfast option. It fills the tummy and does not make one feel lethargic. It provides energy and is easy to digest. Lactic acid bacteria present in the fermented idli batter, helps to alter the PH balance of the intestines making it a healthy food. The fermented process increases the bioavailability of nutrients like folic acid, riboflavin, niacin, thiamine, biotin and Vitamin-K as well as some antibiotic & anti carcinogenic substances. This is because micro-organisms break down complex protein, carbohydrates and fats more efficiently, enabling easy assimilation of nutrients. This also aids a healthy gut flora, since absorption of minerals and vitamins is so much easier. Each idli is only 39 calories. However, the calorie input goes up when paired with chutney and sambhar. But still the overall calorie intake is less than any other popular breakfast dishes like pancakes or puri bhaji as the sambhar will have only a small amount of oil or ghee that is used for tempering spices and herbs. Fat found in coconut is of the healthy kind. It definitely is. A poor man too can afford a hearty meal. There are so many variations of idlis today. Healthy grains like semolina, millets, quinoa, buckwheat, amaranth, oats, other lentils, etc are used to make healthier idlis. Idlis have taken on a new birth or avatar as Manchurian idlis, idli chaat, cocktail idlis, sweet and sour idli, idli 65, cheese baked idlis etc. With so many varieties to suit every palate, idlis have become an anytime snack right from breakfast to dinner and in between. Why am I going into details about Idli for this post? Well, it was my turn to suggest ideas for #188th theme.Some argue that the rice is not good for health but these days rice is easily substituted to include more healthier grains to make this healthy breakfast. As a result I suggested making idlis without rice and another idea. All the members of the group opted for idlis and then fellow member Archana informed us that 30th March is World Idli Day. I didn’t even know that existed. So planning began to make this a memorable event for the group. 30th March has been celebrated as the World Idli Day since 2015. How did this day come about? Its not set by the Government of India or UN or any important body. It is believed that a popular idli only caterer from Chennai, Eniyavan, made a staggering 1,328 varieties of idlis in 2015 to instate this day. A staggering 44 kg idli was also cut by a top bureaucrat to seal the deal as they say and henceforth March 30 became World Idli Day. I have made idlis using semolina, millet and this time I chose to use buckwheat which is known as kuttu in hindi. Initially I thought I’d use buckwheat flour and then realized that the flour may not ferment well. I used buckwheat groat and some urad dal. It is believed that the raw materials like rice and other grains and lentils have small quantity of a specific lactic acid bacteria present. When they are soaked the lactic acid bacteria increase and further more increase when the batter is resting. The lactic acid and carbon dioxide produced by bacteria help to ferment and raise the batter. My batter fermented so well, that I didn’t need to use any leavening agent like baking soda. Here’s the recipe of buckwheat idlis. Make these or any idli of your choice to celebrate World Idli day. I know I’m definitely going to have idlis on 30th March. Do you want to know my favorite Idlis? I simply love Kanjipuram Idli and Podi Idli. Wash urad dal and buckwheat groat separately. Soak buckwheat groat and lentils separately in warm water. Avoid using chlorinated water. Use filtered water. Next day drain out the soaked water and save it. Grind the urad dal first using about ½ cup soaked water. The paste should be smooth. Remove the paste into a big bowl. Add the soaked buckwheat into the blender jug. Add about ¾ cup of soaked water and grind to a paste which is slightly coarse. Add the ground buckwheat to the urad dal paste. Add fenugreek seeds and mix the batter well. Cover the bowl with a lid and put it away in a warm place to ferment. I like to leave it in the oven. The batter should ferment in 8-12 hours time, depending on how hot the weather is. Add salt to the fermented batter and mix it very gently. Lightly smear oil on the idli moulds. Add enough water in the steaming pan. (it should not touch the bottom idli tray). Let the water become hot. In the meantime spoon about 1-1½ tablespoon full into each greased mould. Lower the stacked tray into the idli steaming pan. Shut it with the lid and let the idlis steam for 10 minutes. Remove the stack of trays. Let the idlis cool for 4-6 minutes. Using a butter knife or small spatula remove the idlis from the mould. Repeat steps 15-20 with the remaining batter. 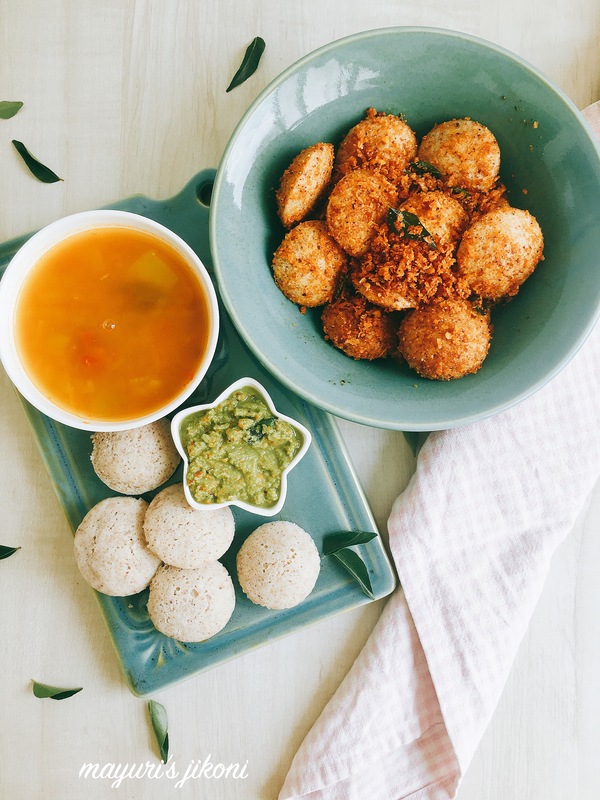 Serve hot idlis with coconut chutney and sambhar. Heat ghee in a wide pan over medium heat. Add curry leaves and coconut. Stir fry for a few seconds till you get the aroma of coconut. Add the podi masala and mix well. Immediately add the idlis. Keep on mixing it gently till the idlis get coated with the masala. Serve immediately with some chutney and sambhar. Don’t add salt to the batter before fermentation. Salt prevents fermentation. It is believed that the soaked water contains lactic acid bacteria which is essential for fermentation. Over steaming the idlis will make them hard. Its best to set a timer and steam them for for 10 minutes for normal size ones and 5 minutes for the mini ones. Use steel or silicon bowls or cups to steam idli in a steamer if you do not have an idli steamer. Every household have their own unique recipe for the sambhar and chutneys. No two preparations will taste the same. There are so many varieties of chutneys prepared that can be served with idlis. I like to leave the sambhar slightly watery as the idlis tend to soak up the sambhar. To celebrate World Idli Day members of FoodieMonday/Bloghop Group made some delicious, soft and innovative idlis. They’ve used alternate grains like quinoa, oats, almond meal, only lentils, rice flakes, soya, semolina, millets, buckwheat to make the idlis. Please check out their recipes by clicking on the links. Wow ! Buckwheat in an Idli is so innovative ! And those mini ones with podi look super tempting ! Loved your beautiful pictures as well. Never used buckwheat to make idli. Fabulous share. Specially loved your podi idli recipe. Next time I will convert my simple idli into podi idli. I love the taste of podi masala and I am sure idli will be more delicious when fried with podi masala. Try making idli with buckwheat its so healthy and diabetic friendly. I too love podi masala. Buckwheat idli sounds super healthy. Loved the pictures . Looks so inviting. Will try if I can get buckwheat in my neighboring store. Thanks Sujata, I bought it from Big Basket and its also available on Amazon. Love these cute mini Idlis all dressed in podi..looking so tempting.. must be a treat with the delicious chutney and that on the side..liked the idea of making fermented Idli with buckwheat groats.. Thanks Swati, I’m a big big fan of podi idli, with or without onion. Diffrevt kind of idli is this. Instead of the flour you ahve used the buckwheat groat which I like the most 🙂 Lovely share indeed ! Thank you so much Priya. I wanted to try out buckwheat idli or dhokra for so long. Thank you so much Avin. Most welcome Lathiya and thanks. Idli with buckwheat groats sounds interesting. Bookmarking to try it soon. Thanks for the lovely theme which made us think out of the box and come out with so many interesting recipes. Thanks Preethi. I’m so glad everyone was so sporty to try out different grains. Thanks Archana, I bought it from Big Basket. Even Amazon sells it. Never tried Indian food since all I knew is that Indian Cuisines are very complicated to make. However upon reading this recipe, it makes me wanna try to make one. Thank you for sharing this recipe. Will surely gonna give it a shot. I love how you have substituted buckwheat for rice in these idlis. They look so soft and delicious and are healthy too. Such a well written post tootoo! Go on Mireille try it. Am sure you’ll love it. I’ve never heard of this food but it sounds very cheap to make and also healthy. Thanks and yes it is cheap and healthy. I have never heard of Idlis but they sound delicious and so healthy for you. It doesn’t seem difficult to make either which is helpful for someone like me. A great breakfast alternative. Thank you so much Scott. If you ever visit India or go to a South Indian restaurant, try out idlis. Thank you so much Kalyani. Buckwheat idli seems to be a healthier option as plain rice idlis I have always believed is a little on the higher side in calorie content. We need to try this out in our home. Buckwheat idlis are actually very good for diabetics as it ranks low on the glycemic index. Please do Snehal, its not difficult at all. This is something new that I’d like to try sometime. It sounds a pretty healthy recipe too. Thanks for sharing. Thanks and it is a very healthy recipe. Yes they are Kaitlyn, staple breakfast for South India. Thanks for sharing this recipe! I have never tried idlis before but am always on the lookout for new recipes. Thanks Jennifer, please do try it if your ever come across a South Indian restaurant. excellent piece on idli sambhar and how delicious and fresh and tasty and healthy this dish is thanks i will try at home. Thanks and most welcome, the one you may have tried is the typical rice and lentil ones. I love that you give us so many insights of your traditions and typical flavors and recipes! IT makes me travel with my senses, even if I’m just reading all this. I didn’t know this particular recipe and it’ll look so interesting. I just have to make sure I can find the ingredients ! Thank you so much. If you every come across a South Indian restaurant, they surely will have the normal rice and lentil idli on their menu. These days event even ready made mixtures are available where one just has to add water or yogurt to the mixture and then steam. Ooh I’ve never heard of idli before! They look delicious! Thanks Ashley, staple breakfast in South India. Buckwheat in an Idli is so interesting to me and yours looks so good. Plus it was not too hard to make. I’ve been trying to find more ways to use buckwheat, so thank you! Thanks and most welcome, please let me know how it turns out for you. Looks so good! Pinning to try sometime soon! I’ve never heard of this before, but it seems fairly simple to make with your recipe. I’m definitely going to give it a try. Thanks for giving me the opportunity to learn something new today! Thanks Erica. Hope you do get a chance to try it. I totally want to live at your house! These look easy and delicious; adding to my list of things I hope to get around to trying! So sweet, you’re most welcome to stay at my home. Any questions when you try out the recipe, would love to help out. I really admire the way you manage to create all these lovely innovative dishes from scratch!! These idlis look really delicious. Thank you so much Mina. Idlis are my favourite.. I haven’t tried making any dish with buckwheat. Must give it a try. Thanks Shobha, please try buckwheat. Its a great health grain. I’ve used it in khichdi, in salad and now idlis. Thanks Veena, I think the hot weather helped in the fermentation. I tried this recipe and I couldn’t get the idlis. The batter was fermented but when I put them in dili moulds to steam, the batter collapsed and spread all over the plate. I will probably try it as dosas but I doubt I can make idlis with them. The only reason it could have collapsed is that it may have too much water. The buckwheat soaked up all the water. I didn’t add any extra water while grinding. I am so sorry the recipe did not work for you. After posting the recipe I made the idlis again to share with my neighbor and it turned out good. So really don’t know what went wrong for you…perhaps over fermentation.